Our selection of plastic wheelchair bearings are mainly for MRI wheelchairs. 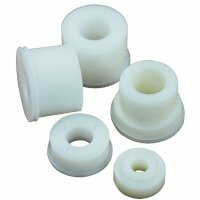 With our plastic bearings selection you'll be able to find just what you need. Wheelchairparts.com does its best to provide the widest variety of low priced wheelchair parts and MRI wheelchairs are no exception. We bring you the best in all types of wheelchair parts as well as other medical equipment parts. Our plastic bearings are guaranteed to be non-magnetic. Be sure you find the right measurements for your plastic bearings. All you have to do is measure the inside diameter of your plastic wheelchair bearing, then measure the outside diameter. We have many different images in the beginning of our bearings sections so you can view how to find the proper measurements. All of the bearings you see here are for your fork stems and rear wheels, be sure you know which one you need and if it has a flange or does not have a flange. If you have any questions on plastic wheelchair bearings please do not hesitate to call our friendly customer service at 1-800-328-5343. We will be happy to assist you with your every question and to help guide you to the right plastic bearings for you and your wheelchair.